How unique would it be to give a special gift that keeps on giving, for a lifetime? This is a perfect way to enable someone to experience the sports psychology process, and to improve their mental game. Whether it is for a birthday, graduation, the holidays or simply because you feel like it, this gift will be greatly appreciated. We mail you a handsome gift certificate (a larger version of the sample certificate at right) that you can present. 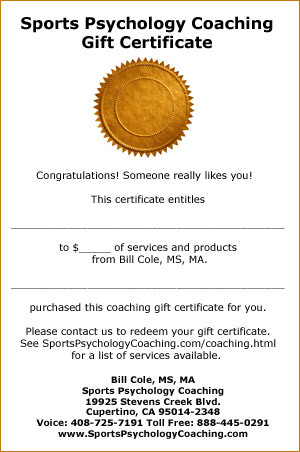 The gift certificate can be for any of our Sports Psychology Coaching packages, including one hour of coaching for $125 and the New Client Discount Package, which includes three hours of coaching and many other benefits for only $300. 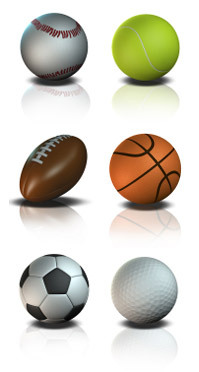 Find out more about these and other coaching services. To purchase now through PayPal using U.S. dollars, click on the PayPal button below, set Item to "Sports Psychology Coaching Gift Certificate" and set Unit Price to the dollar amount of the Gift Certificate you wish to order. Or contact us by phone or email for other ordering options.